As European scholars, our role is primarily to train students to think comparatively, in order to build a common legal culture all over Europe … As European lawyers in the 21st century, our mission goes beyond comparative teaching. … Legal scholarship has played its role as a guide to the European legislator. … The same phenomenon may be observed in those of our countries where the recodification of important parts of the law is envisaged. This notably occurs in France as regard contract law, a key subject for comparatists and European scholars. 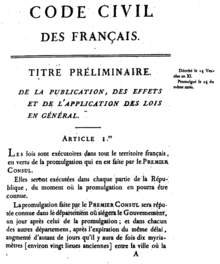 First page of the first edition of the Code civil. After the Catala Avant-projet was published and handed to the Ministry of Justice, many discussions and conferences took place … [and] a new academic project was prepared under the chairmanship of professor Francois Terré … This project drew inspiration from all the various existing European and international models … [on foot of which, in 2013] the government issued a Projet de loi du 27 novembre 2013 relatif à la modernisation et à la simplification du droit et des procédures dans les domaines de la justice et des affaires intérieures … [but] on January 23, 2014, the French Senate refused to adopt [it] … [but] this is not the end of the story. … The principles which currently underlie the French law of contracts have been strengthened by this new Project. – consensualism is enunciated and in this respect, the French project may seem to resist the creeping formalism that is to be observed in EU consumer law, in the CESL and in many specific contracts. – contractual justice, coherence and good faith are reinforced. This goes along the lines of EU law, as well as of some recent codifications. In several laws (notably in German, Dutch and US law) or codifications (PECL and Unidroit principles), good faith acts as a general principle for all the phases of the life of the contract.